Ministry of Propaganda - 10/Dec/2006: "Ogbourne Sunday Walk"
After a very sunny day yesterday this morning started quite nice, while cold with some frost it was quite sunny. Unfortunately the clouds soon moved in, but I left for the Rangers - A Winter View walk. About 10-15 other walkers had decided to brave the forecasted rain as well. Soon we left, past Upper Herdswick Farm we reached Smeathe's Ridge. 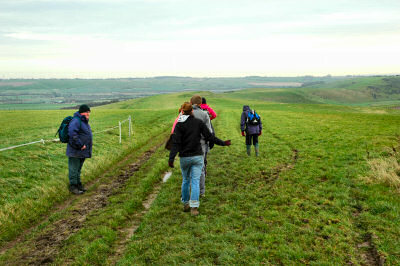 We followed the ridge towards Ogbourne St George. So far it was still dry, occasionally it even brightened up and the sun broke through. It didn't look too much like winter, so we didn't really get the advertised winter views. Some nice views over Ogbourne Down were still to be enjoyed. Having arrived in Ogbourne St George we briefly stopped at the church. We didn't go inside, but were told that there is some William Morris tapestry inside. Along Chantry Meadow and through Southend we continued towards the next Ogbourne: Ogbourne St Andrew. 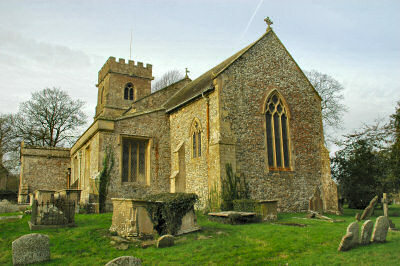 In Ogbourne St Andrew we stopped at the church as well. We had a quick look at the church before it was closed after the morning service. Unfortunately then the rain slowly started, our lunch break was shorter than originally planned. 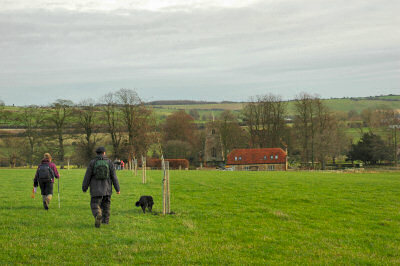 We then walked west for a short while before turning north for the way back to Barbury Castle. The final stretch past the Four Mile Clump was quite wet, both from above and below. The rain grew stronger and stronger and the track was quite muddy in places with large puddles to be walked around.